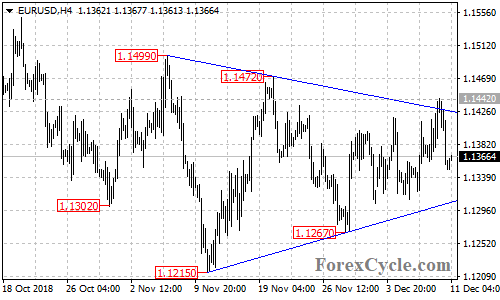 After touching the top trend line of the triangle pattern on the 4-hour chart, EURUSD pulled back from 1.1442, suggesting that lengthier sideways movement is underway. Deeper decline towards the bottom trend line of pattern would likely be seen in the coming days, a breakdown below this trend line could take the price to 1.1200 area. Resistance is at 1.1442, above this level would aim 1.1500 area.